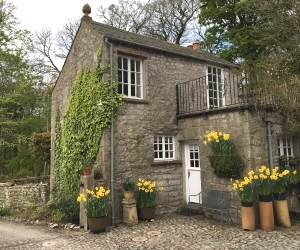 Our secluded and quirky cottage is tucked away in the grounds of our private estate, a perfect romantic hideaway with easy access from major routes to the Lakes and Yorkshire Dales. Locally on your doorstep are Nature Reserves rich in flora and fauna, and Leighton Moss for bird watching. Access through beautiful parkland to your private oasis, where you will find a beautiful Thomas Mawson garden where peacocks roam. Enjoy evening drinks on your private roof terrace overlooking the old Stable Yard, and you will attract a few avian visitors, or play tennis on the private court in the park. The cottage is accessed via a drive through private parkland on our small South Lakeland estate. The cottage is "upside down" with the living room upstairs and the bedroom kitchen and bathroom on the ground floor. There is access to the roof terrace from the living room, where you can peacefully watch the peacocks and white doves going about their day. There is access to the beautiful parkland and tennis court, or stroll through the woodland to find the Nature Reserve just behind the cottage. The cottage is just behind the main house so we are usually around to help with any queries or information about the local area. Our gardener Jeff is on site daily and he has huge knowledge of the local countryside. We look forward to welcoming you to Stable Boy's Cottage. Read what our guests say about Stable Boy's Cottage on TripAdvisor.